The Lab is a college wide resource, giving both students and faculty accesses to fabrication equipment and a production space in a multidisciplinary setting. The lab is open to all CoMAD students and faculty. 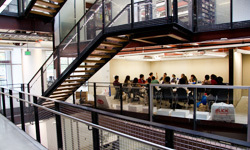 During the academic year the Lab hosts a variety of college wide workshops, and actively promotes interdisciplinary design research and teaching. The Hybrid Making Lab has a variety of micro and small scale tools geared toward model making and small scale prototyping. In addition the Lab has two Universal Laser Cutters. To use the Hybrid Making Lab all students and must attended an orientation session. The orientation covers the basic use of the lab tools and the laser cutter.